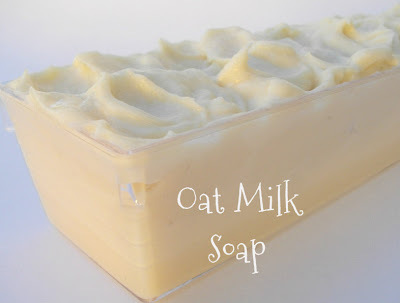 I adore any soap with oatmeal in it, so making oat milk to use in soap has been on my to-do list for a while! To mix my lye solution, I used half of the water called for. I added the other half of the liquid as oat milk at trace. Unfortunately, the fragrance that I used accelerated; I know it was the fragrance and not the oat milk because the small portion of the soap what I kept unfragranced (for swirling) behaved beautifully. The acceleration meant that I was only able to quickly layer the soap instead of swirling it, but thankfully I had quite a bit of leftover unfragranced soap, so I was able to use it to texturize the top somewhat. The soap ended up gelling all the way through without any insulation. The fragrance I used was a dupe of Lush's Karma. Lol! I can just imagine her reaction! Thanks Jenny =) I'm excited to try it, to see if it really does add anything to the soap. I feel like everytime I cross something off my list, I add 5 more things to try...is that the same for you?! It makes a very nice soap, let me know what you think of it! Did you already try the soap? Has it cured? I am very curious about oat milk performance and how does it differ to other vegetable and animal milks. What are your impressions? Thanks for the feedback! Email just sent!